Creative play helps children flourish as confident, resilient and happy individuals and it is vital for child development. Creativity is a key ingredient for children to learn how to follow their curiosity, solve problems and make sense of the world. Our Creative Journey is aimed at promoting good practice in all types of early learning and childcare (ELC) settings, to help all services aspire to be the best they can be and have the greatest impact on children's lives. In this resource featuring good and innovative practice examples, the Care Inspectorate has shared and celebrated some of the wonderful experiences we are seeing and hearing about when we visit services all over the country. These examples include art, drama, pretend play, music and song, model making, loose-parts play, storytelling and dance. 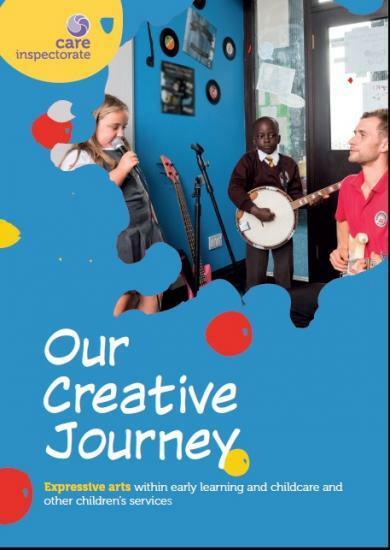 This resource is intended to reflect and encourage the exciting blossoming of expressive arts that we are seeing across services for children. "We feature practice examples from across the full range of ELC service types, including childminders, playgroups and out of school care as well as private and local authority nurseries. This means that ELC provided by the private, voluntary and statutory sectors is equally represented. We have tried to reflect the wide range of children experiencing ELC, from babies through to secondary school age children, and the different needs and backgrounds of children. We have chosen examples from rural as well as urban settings and from deprived as well as affluent communities. Similarly, we have tried to include a wide range of examples and not just services that are most commonly used by children in our communities and not just to showcase a few high-profile services achieving outstanding grades."